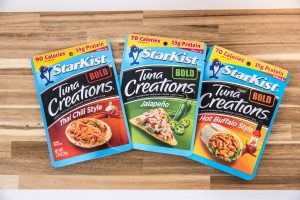 Have you tried StarKist’s newest flavors? They’re bold and delicious! You are here: Home / Featured Products of the Week / Have you tried StarKist’s newest flavors? They’re bold and delicious! Looking to add some spice to your lunch? Do you love tuna but maybe a bit bored with the same old tuna? Well…you’re in luck! StarKist has some new flavors and they are bold! I love the new flavors and that these pouches are quite convenient for on-the-go but there are also recipes included and they are easy to make! 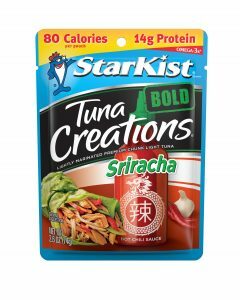 The new StarKist Tuna Creations are a hit because I love that I can make simple and quick meals and they taste great! The Tuna Creations with Rice & Beans, for example, has a delicious Tuna, Rice & Beans Salad Cups recipe on the pouch and the Jalapeno flavor has a Simple & Spicy Tuna Taco recipe! Yum! My favorite though is the Siracha flavor with red chili peppers, and garlic. I loved the Siracha Tuna Lettuce Wrap recipe that is included on the pouch! I think I could eat those every week! Look for them at a store near you! Self Disclosure: I received samples of the above delicious flavors. Images were provided.